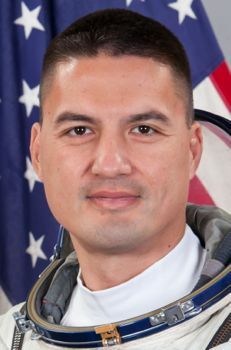 American physician mission specialist astronaut, 2009-on. Status: Active 2009-on. Born: 1973-01-23. Spaceflights: 1 . Total time in space: 141.67 days. Birth Place: Taipei, Taiwan. Family: Astronaut. Country: USA. Flights: Soyuz TMA-17M. Bibliography: 5698. 1973 January 23 - . Birth of Kjell Norwood Lindgren - . Nation: USA. Related Persons: Lindgren. American physician mission specialist astronaut, 2009-on. 1 spaceflight, 141.7 days in space. Flew to orbit on Soyuz TMA-17M (2015)..
2015 October 28 - . EVA ISS US EVA-32 - . Crew: Kelly, James, Lindgren. EVA Duration: 0.30 days. Nation: USA. Program: ISS. The Quest airlock was depressurized from about 12:00 GMT to 19:19 GMT. The crew removed a thermal cover from a failed MBSU unit, added thermal covers to the AMS-02 particle physics experiment, installed cabling for the future IDA docking adapters, and lubricated part of the LEE-B end of the Canadarm-2. Part of the LEE lubing and the IDA wiring, as well as the installation of a vent on Node 3, were omitted due to lack of time. 2015 November 6 - . EVA ISS US EVA-33 - . Crew: Kelly, James, Lindgren. EVA Duration: 0.33 days. Nation: USA. Program: ISS. The airlock was depressurized around 11:20 GMT and repressurized at 19:10 GMT. The astronauts successfully reconfigured part of the station's cooling system on the P6 truss segment. The work went a bit slower than planned, though, and a backup radiator panel (the P6 TTCR) had to be redeployed because there wasn't enough time to fasten it down; this leaves it a bit more vulnerable to space debris.